SAP is able to provide real-time business intelligence to SMEs with the lowest total cost of ownership. This is one of the reasons why Gartner has recognized SAP as a leader in all four analytics solutions areas - BI Platforms, Corporate Performance Suites, Data Integration Tools and Data Quality Tools. Over 22% of the BI market is dominated by SAP. With 20,000 enterprise mobility customers representing, SAP is the proven market leader in mobile solutions. 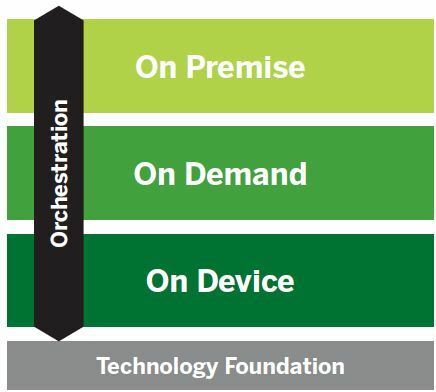 SAP's mobile solutions include their best selling mobile enterprise platform, device management and SMS and MMS messaging. 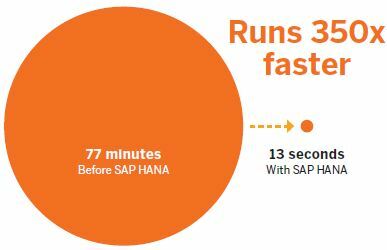 SAP delivers real-time ERP through the most advanced in-memory technology - SAP HANA (High Performance Analytic Appliance). SAP HANA provides a foundation on which to build a new generation of applications, enabling customers to analyze large quantities of data from virtually any source, in real time. The graphic to the right showcases an actual SAP customer's performance of a core reporting process. SAP provides the best service to measure and maximize business value. Software users are able to benchmark business process by establishing a performance baseline and setting goals. Training is also available for team members to help develop value management capabilities. Furthermore, collaboration opportunities are available with SAP. All of this helps companies run on time and on budget, providing value to their own customers. SAP helps reduce users' total IT costs so that more funds can be spent on innovation. SAP users enjoy 23% lower implementation service costs per component than the leading ERP competitor, as well as 9.3% lower total software, service and support per user. Learn more about the SAP implementation process. With the best software support services in the industry, SAP and Algorithm provide peace of mind about your organization. Through their strong partner relationships and open ecosystem, SAP provides the choice and flexibility to find the best fit software.